We're living in an era of affluence. There's no doubt that the world's quality of living is at its highest its ever been, exemplified by increasing life expectancy throughout the developed world. Then, why do we have the highest level of healthcare costs in human history? There are innumerable services and initiatives aimed at addressing specific needs of our vulnerable populations, but why do they still suffer from poor, expensive, inaccessible quality of care? "3.6 million Americans miss or delay receiving nonemergency medical care each year due to transportation challenges." There are a number of reasons for this dichotomy, including social determinants of health, socio-economic factors, and an overall disjointed health system that continues to operate in silos. However, one major factor that's been overlooked, especially in the days of on-demand transportation like Uber and Lyft, is easy-to-use, accessible transportation. Seniors and other at-risk populations often miss important appointments and check-ups that are designed to prevent costly hospital admissions. Seniors requesting rides never had to change behavior or learn something new, while AIM was able to provide 74.6% more rides due to the increase in efficiency. i3 client, Action in Maturity (AIM), is a senior center without walls providing transportation and social services to aging adults. The purpose of which is to "provide appropriate activities and services to benefit the personal development and quality of life of older people and to support their ability to live independently within the community as long as possible." AIM's web-app admin dashboard, new request view - the app was developed using appsheet.com. Like many community-based senior providers, AIM's internal operations had for years been conducted through a series of paper-based ledgers, which were eventually transcribed by hand to Microsoft Excel for grant reporting. The primary service documented in this fashion was Transportation by Request (TBR), where a senior can call in to request a ride from AIM's highly discounted shuttle service. i3 helped migrate this process from a time-intensive pen and paper process to a customized web-application admin dashboard and integrated driver-dispatch mobile app, designed and developed by Jake Tunney. 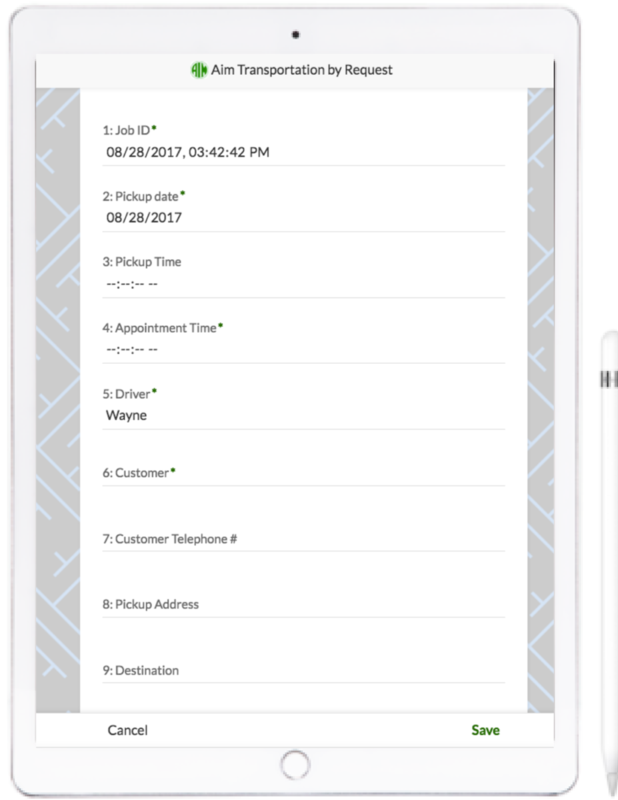 AIM operators now get a simple web form for new requests while drivers use their mobile devices to access new ride requests. According to Liz Briscoe, AIM Executive Director, "The beauty of the system is to accommodate more requests for rides. Before the technology, we were drowning in paper. Now, the customized technology creates a daily manifest and transfers the ridership statistics into excel format, resulting in our ability to expand our transportation program. It has elevated our program and has had an indirect impact with increased membership. Because AIM serves the senior cohort of Baltimore City older adults, attrition can affect membership; however, we are far exceeding that historical baseline at a time when senior centers are struggling." This is an example of how technology can improve the lives of seniors without them ever having to touch a smart phone or learn something new, which is a big obstacle when it comes to adopting new services. If you're interested in learning more about how i3 can serve your organization's needs, feel free to reach out to Jake Tunney here.